Good news: On Thursday, the counter top was installed. On Friday, the appliances were hooked up. Now the kitchen re-do is nearly complete! I say “nearly,” because the contractor still has some cabinet tweaking to do. Also, I haven’t yet selected a tile backsplash. And lastly, only the room’s south and west walls have been tackled. Matching base cabinetry will be installed on the east wall later this month. 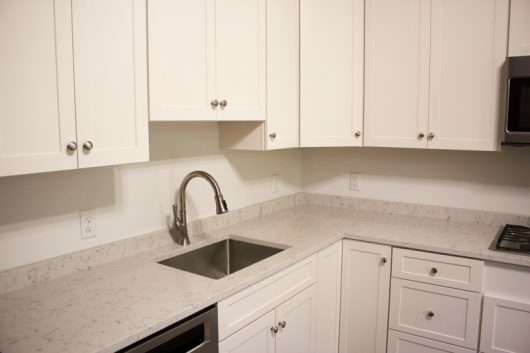 I love the gray-veined, white quartz counter top. I love it so much that I can’t bear to clutter it up with my batterie de cuisine. Give me time, folks. I love the sink! It’s wide enough (22 inches) to accommodate my large baking sheets and cutting boards, and deep enough (10 inches) for my tallest stockpots. 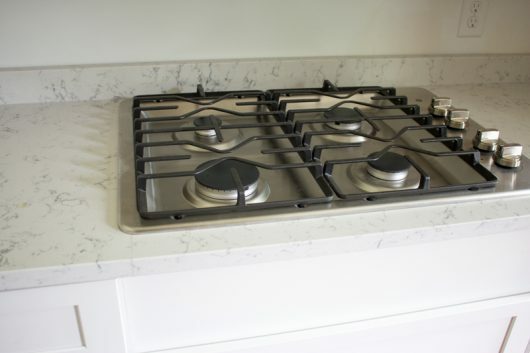 The gas cooktop, from General Electric, is the best I’ve ever owned. (The contractor has yet to install the drawer panel that goes in the empty space below.) I purposely selected this cooktop because its knobs are on the side, and out of reach of a certain counter-surfing canine. The double ovens are a dream. I’ll discuss them later in a separate post (or in a video). 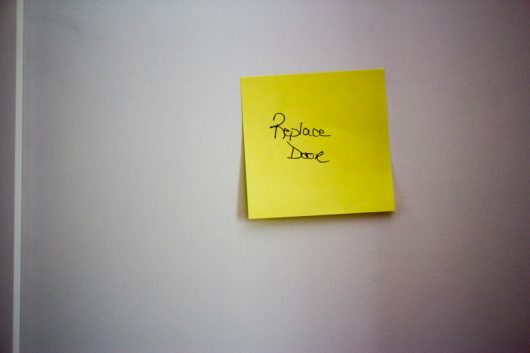 Wondering about the yellow Post It notes on some of the cabinetry? These indicate problem areas that the contractor will address. One cabinet door was poorly finished — the new replacement door has already arrived. In closing, I’d like to thank you for staying by my side throughout this krazy kitchen project. Please know that I kept your comments and suggestions in mind when purchasing the new cabinetry. That’s why you see more drawers than doors! Looks fantastic, Kevin, and you will love having more drawers than doors! Love it! Always thought if I could redo my kithen, I’d opt for more drawers. I am thinking how nice a light backsplash would look if you incorporated maybe a line of greyish tiles that picks up the color in the countertops. Have fun and create more masterpieces!!! Love that you went to the ceiling with the cabinets, no more dusty wasted space. Sorry meant drop dead gorgeous n I love the marble! Wow, Kevin. The kitchen is perfectly beautiful. 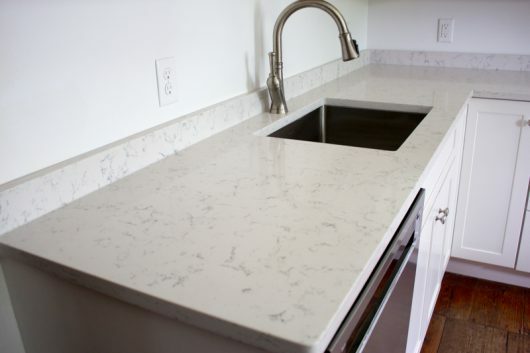 Really love that quartz countertop. The kitchen looks professional yet elegant. Awesome! I see you have some stainless steel and glass items. My tip for removing fingerprints and making them sparkle ( before you ruin them by using ‘recommended’ cleaners ): drizzle a little non-bleach soft scrub into a wet microfiber cloth. Wring out. Wipe surface all over until prints are gone. Liberally spray straight white vinegar on said surface and wipe completely dry with clean Terry towel (that has been laundered without fabric softner) Voila. Sparkle! and no harm to the surface. My advice for keeping a clean and sparjkkling surface is to use just water and Norwex Enviro cloth and window cloths. No need for bleach or nasty chemicals. Keeping everything healthy for you and your precious family. More cleaning tips- essential oils like thieves, lemon or purification + a little vinegar+ a little Castile soap and water. Not harsh; removes bacteria, voila! For the backsplash tile, given the age of your home a white subway tile with a light gray mortar would match and highlight your gray veining. This is what I used, though I used bevel edge subway to give it a textural pop. Question/ where on earth did you find that color mixer? The bright green is wonderful and I’d love to but one if I could find it. It looks GAW-JESS, Kevin! I’m jealous because I started my kitchen reno the same day as you, but am only about halfway​ through (floor issues, crooked wall issues, plumbing issues…) Ugh. Hopefully will see some forward momentum, this week. A whole new outlook on life, fostered by an efficient, stylish kitchen. Bravo! Simply ethereal ! Pristine! A restful and sublime oasis, wherein your culinary genius may flow….ahhh. now, time to miss it up and get cooking! On my wish list & much needed – hors d’oeuvre recipes that delight, yet with few ingredients, such as billionaires bacon, or that cucumber lobster thing….packing ingredients for a boat to island summer, where perishables perish rapidly! Yet gardens abound. Lovely! I noticed immediately after my own kitchen remodel that the food tasted better….possibly because the chef (myself ) was happier and more relaxed in a more efficient and beautiful kitchen space. Enjoy!!! At last! An atelier worthy of your Q-linary artistry! You made it! Great new look and will make you happy for a loooong time. Timelessly beautiful! Love it. Enjoy! Very pretty! Go for COLOR in that new backsplash! Your new kitchen is lovely! Don’t you just want to pull a comfy chair in and sit for a while and admire and then plan what you will cook first. I am happy for you! Just keep your drawers clean and dry. Seriously, great choice. 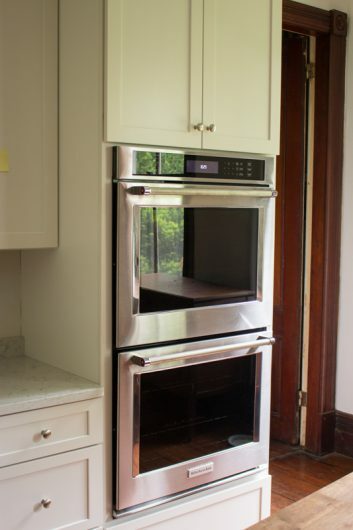 My last house had double wall ovens. . .fantastic and so uber efficient and easy on my back. Love the tips from fans on how to take care of your kitchen surfaces. I am a housekeeper and will use and share some of the tips. Like your new kitchen, but it needs some color! When I first read the article I thought to myself why did he wait so long to pick out a backsplash. The more thought about it though, the smarter I thought you were! While the kitchen is yours, it is also going to be filmed frequently so you may want to look at backsplash possibilities through the lens of a camera when making your decison. Would love to see some color! Love your new kitchen, but love your sweet Avery more! She has such a thoughtful expression and beautiful soulful eyes. You must make her some dog biscuits in your new kitchen! Kevin, your kitchen is a dream come true. I’m sure you will enjoy all the new features and the white will soon have color companions doted here and there. I love it. Wow! What an amazing difference! Beautiful….simply beautiful! Kevin, your new kitchen turned out beautiful. As for my kitchen, it has bricks going up the wall behind the stove. The bricks were there when we moved in. I painted the bricks, a soft creamy off white, and have been happy with that look all these years. The brick adds texture and interest, and the creamy off white color goes with everything. For easy kitchen clean up and getting rid of bacteria in the kitchen, I use Hydrogen Peroxide in a spray bottle and go to town with it on all of the surfaces in my kitchen. It shines up the surfaces and gets rid of bacteria all in one, with no harm to anything. Thanks for sharing photos of your new kitchen. I know how excited I get when I get a new appliance so I can only imagine how you are feeling now. When my new gas stove arrived a few years ago, I kept walking back into the kitchen just to see it again and my two large burners instead of one. Before going upstairs at night, I would turn the kitchen lights on just to take another look. I wish you many delicious meals and recipes in your new kitchen. Now you just have to remember where you put everything as you return all your equipment to cabinets & drawers! Have fun!! Great results. I’m in total agreement regarding a pop of color. Once you have your colorful back splash you may want to check out some fun door pulls for the upper cabinets or a select few. I love my ceramic knobs & so easy to change out, kind a like a new sweater. The brushed stainless lower pulls match your appliances and look great. Go for the fun and color! 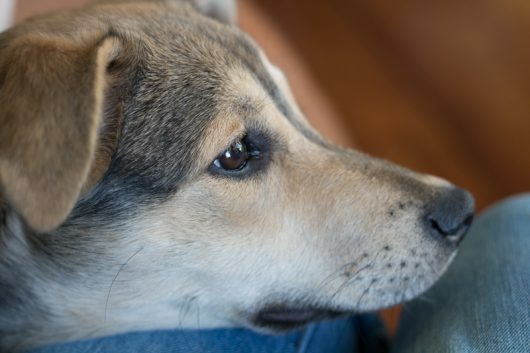 Give that sweet pup a good ear rub for me. Happy cooking. My friends rave when I make your recipes. Beautiful renovation! Can’t wait to see the wonderful recipes that created there. Absolutely PERFECT, Kevin! You made a clean, attractive, efficient workspace for a COOK! You DID NOT make a showy, over-furnished and over-applianced showplace to impress. The quartz is pretty, the best choice for endurance, easy care. I love that you kept your wood-topped island, a happy and comfortable place to prep. Beautiful room! Happy creating space! Enjoy! Make food! Share it with us! Great love to you and yours. I’m so happy for you! Having lived through a 13-month (!) kitchen reno immediately prior to a cross-country move, I’m impressed with how speedy yours has been accomplished. 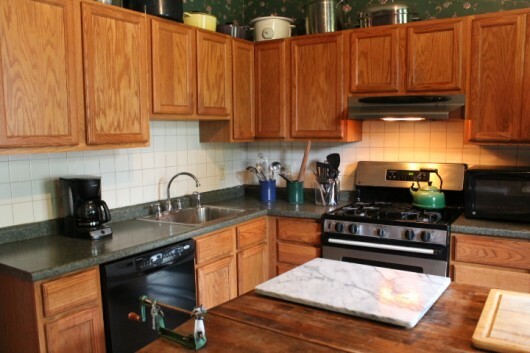 I’m also impressed with the excellent advice your readers are giving you re: backsplashes. Can’t wait to see what you decide! Kevin, it’s just beautiful! You deserve to have a kitchen worthy of your talents. Happy cooking! Looking pretty swift there, Kevin! You are going to love working and doing videos in your new kitchen. I agree, if I do a kitchen reno I would put in way more drawers. Right now my kitchen is nearing 35 years and not so swift but clean. 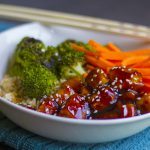 I am making your teriyaki tofu bowl today! Roasting Broccoli will be new to me but we love that vegetable. Are you sure you want a back splash? We used a good quality paint which wipes off easily and is always in style. Although some of the new back splashes are stylish, some are already feeling like last year. It looks great (even if not complete), so enjoy! Kevin, it may be a little late for this…..but I noticed the natural light seems to be coming behind you when working at the counter or at the sink (a lot of our cleanup work is done at the sink when the sun has already set) I do hope under-cabinet lights were considered and installed. Wow, it turned out beautiful ! Love the countertop cook top . A great job ! Now lets get cooking !!! Your cabinets and countertops are as close or the same to what I just did in a bathroom. I love the white on white. Looks beautiful, but I always wonder why people choose white for kitchens? Must have way more time for cleaning than I do! May you love every moment. I also was wondering about under cabinet lights. Mine are a necessity. Also love double ovens – can’t wait to hear what you have to say about yours. The kitchen is so bright and cheery. It’Lloyd look great in your videos. What fun to enjoy your excitement! I look forward to this each Sunday and can’t wait to see what else is in store. You will be sooooo happy with your new kitchen. You will wonder why you took so long to have it done (other than $$). I think you should pick a big bouquet of your favorite flowers and put them in your wonderful kitchen. Pick out a color from them and incorporate that into your back splash. The color of your kitchen(white) should be viewed as a background with counter appliances, bowls, flowers, etc as the bling. That way you could always vary the look . Beautiful! 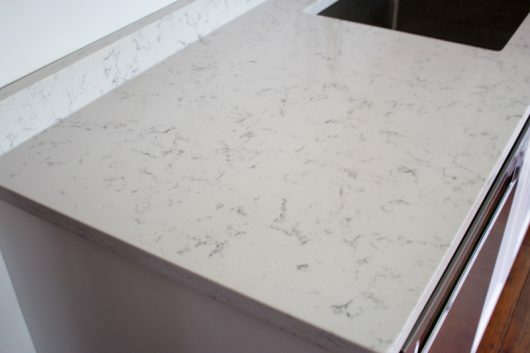 You will love your quartz counter tops! Just remember they are heat resistant not heat proof. Something extremely hot would crystallize the beautiful counters. Speaking from experience. . But you will love have blueberries and red wine doesn’t even faze it. Looks really great, Kevin! Can only imagine the hours of enjoyment you will have in your lovely kitchen, conjuring up more great recipes for us to try! I am so excited for you! You will love your kitchen daily. You deserve all the best! So bright and a great feeling of space. Love it!!! You’ll be cooking up an even bigger storm now!! Beautiful new kitchen !! Let the color come from easily changed items….appliances, towels, curtains. It looks great! How about a glass subway tile that picks up the gray in the counter. Bling without ostentation…. I’d go for a glass backsplash instead of tiles. They’re so much easier to keep clean and no grout to go brown, which it inevitably does. Smoky grey would be good and then add bits of colour with appliances, flowers and so on. Otherwise, I’d say pick a strong but soft colour eg celery green that you love enough to set the tone for the kitchen. Love your new kitchen, Kevin! Thanks for the tofu bowl recipe, too; can’t wait to try it. Also, for any readers wanting to eat less meat who haven’t yet tried Kevin’s Black Bean Burger recipe, don’t delay in finding and trying it. The best burgers EVER! Luv a white kitchen and yours looks just great…it looks like it belongs to you so enjoy!! CONGRATULATIONS!! Almost there and the worst is over. What a beautiful kitchen. Enjoy. Love your new cabinets, Kevin–ENJOY!!! The man who built my stone countertops said to spray Lemon Pledge on counters regularly to protect and keep them looking nice. I use left over squares of cut tile in different sizes (from a bathroom tiling job) under hot pots to protect my new countertop. They match the counter. I glued inexpensive little self-adhesive felt circles from the hardware store on back of tiles protect the counter. Nice to have “free” counter protectors in sizes that fit my pots –and which glide easily on my counter without scratching! Wow! What a dramatic and beautiful transformation! I hope you love it all. We moved last summer and our new house has a dream kitchen, and I honestly don’t remember how we ever made do before. What a dramatic difference!! I can certainly see why you don’t want to put anything on the counter – you just need the 1st ding in the counter and that feeling will go away, LOL! Your kitchen is so bright just the way it should be!! Fantastic job! Kevin! Looks fabulous and a kitchen that inspires cooking and baking … wonderful appliance and finish choices. What a joy for you to create more yummy recipes for us! Love everything about it! Congratulations! LOVE LOVE LOVE WHITE! I did my whole kitchen in white. So peaceful. FYI I did white ship lap as back splash. Could send you a picture … how can I do that. 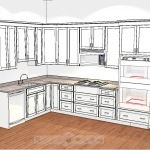 Your new Kitchen will be a marvel & exquisite hang out place when completed. Looking forward to seeing your completed new Kitchen soon. 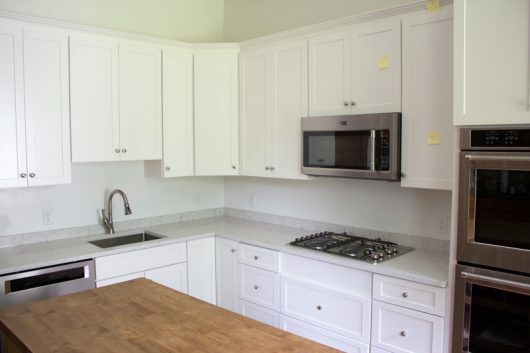 I like your white kitchen with stainless appliances and the Shaker style cabinets. Up-to-date, timeless, very chic imo. Enjoy! 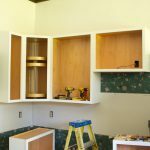 Did you ever completely finish your kitchen renovation? I really would love to see the backsplash tile that you picked out & the completed project! Love all your articles! Hi Maureen – I haven’t yet selected the backsplash tile. Soon!